A code is entered into the keypad and the equipment opens. Safety and closing facilities can be by induction loop or photo-electric cell. See what our customers had to say about our work with security lighting here, and here. Security lighting provides an excellent deterrent against intrusions and other criminal activity on your property or building by exposing the intruder and making him/her feel vulnerable to detection. Security lighting can also help detect intruders and even make you feel more secure in knowing that you have taken physical security measures to help protect against crime in and around your home/premises.We can supply and fit a number of Security lighting that come with a variety of contoling systems ranging from a totaly manual to easy to use fully automatic systems. 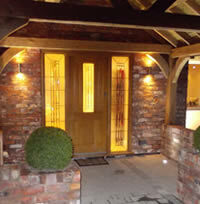 A couple of lights just beside the front door to illuminate the area for guests or to see who is there before needing to open the door. Lighting along the drive and near the gate. Lighting around the house and gardens, when a noise would be heard, to illuminate a potential intruder. Dusk-til-dawn with a PIR System. Firstly PIR stands for Passive Infa Red and in laymans terms is a system that detectsmovement. This system is the first type of automation that security lighting uses so that the light will only switch on when someone is moving around the property. Sensetivity can also be adjusted on these lights so that the light doesn’t go off every time the cat walks across the grass. With this is then a dusk-til-dawn sensor which then will only let the security light switch on when it gets dark. 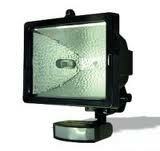 This stops you wasting electrcity with the light going off all through the day. Not only that, but these lights can also have a manual over ride just in case you wanted to blast the area with light should you want to confirm the pressence of an intruder or the kids want to play floodlit footbal. These control systems can be programmed to cover all of the above situationsas well as switching on and off periodicaly, for instance when you are on holiday or away on business, persuading the potential intruder that there is someone still at home or activity on the premisses. These can be programmed for just the two weeks when you go on the family holiday, or programmed to work all the time especially useful if you are away on business a lot or make a few last minute getaways. Remember yet again although the programmer would switch the garden lights or drive lights on and off at certain times the dusk-til-dawn controller would only let the light switch on when it is dark.